Victoria Moran has been a Main Street Vegan® for 31 years and is an obesity survivor, maintaining a 60+-pound weight loss for all this time. She’s the bestselling author of twelve books, including Creating a Charmed Life (in 30 languages around the world) and the plant-based weight loss classic, The Love-Powered Diet, and the iconic Main Street Vegan. Her latest book is The Good Karma Diet: Eat Gently, Feel Amazing, Age in Slow Motion. Her college thesis became Compassion the Ultimate Ethic: An Exploration of Veganism, originally published in 1985 and the first work on vegan philosophy and practice to come from a major publisher. 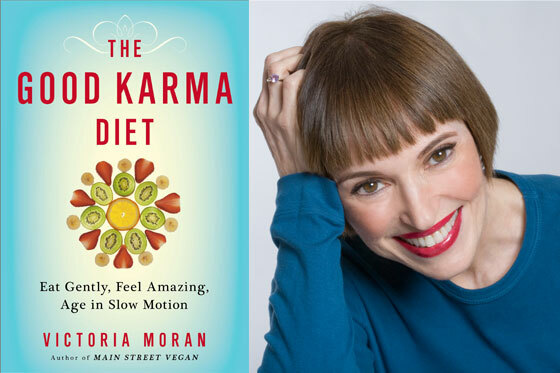 Victoria is also an inspirational speaker, corporate spokesperson, certified holistic health counselor (HHC, AADP), graduate of the T. Colin Campbell Foundation/eCornell program in plant-based nutrition, host of the Main Street Vegan radio show/podcast, awarded Outstanding Vegan Media Outlet 2015, and founder and director of Main Street Vegan Academy, training and certifying vegan lifestyle coaches. Moran lives with her husband, writer and musician, William Melton, in a LEED-certified green condominium in New York City’s thriving Harlem neighborhood. They’re co-writers of the feature film in pre-production, Miss Liberty, and co-humans to a rescue-dog, Forbes. New to Tranquility du Jour? Peruse my FAQs.